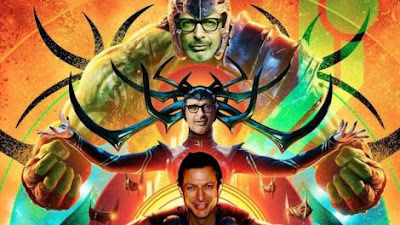 On the latest episode of Geek Gab, we discuss three new movies, including the latest entry in the Marvel Cinematic Universe, Thor: Ragnarok. I also have an announcement for Geek Gab listeners. My "watch it burn and bring marshmallows" position on the collapse of Hollywood is no secret to frequent readers of this blog. This well-deserved contempt for Hollywood has led me to severely reduce my consumption of new releases, and with the industry doubling down, I may end up not seeing any new movies at all for the indefinite future. The format of Geek Gab Prime has found its groove as a new Hollywood release review show. I'm not questioning this development. The other hosts and the audience enjoy it. However, as the one guy on a movie review podcast who doesn't watch new movies, the insights and entertainment value I can bring to the table are limited. More to the point, my evolving understanding of the indie publishing industry has led me to realize that my writing output must increase if I am to succeed in the new publishing landscape. I've been making strides toward that end, but my increased writing and editing workload now leave me little time for anything else, including, sadly, regular podcasting. It is with a heavy and grateful heart that I announce my retirement as a host of Geek Gab, effective immediately. Daddy Warpig and Dorrinal have been informed and have accepted my resignation with class and professionalism. I'm sure they'll rise to new heights, and I'll be there cheering them on from the audience. Thank you, Daddy Warpig and Dorrinal, for a fun and horizon-expanding journey! We traveled this road together for almost three years, and I'm eternally grateful you invited me along. To everyone reading out there, be sure to keep catching Geek Gab Prime every week and Dorrinal's Geek Gab Game Night specials. On the bright side, this means you'll also be getting more stories from me. On that front, The Ophian Rising, Soul Cycle Book IV is rapidly nearing completion. Subscribers to my newsletter can expect some special surprises in the coming days. 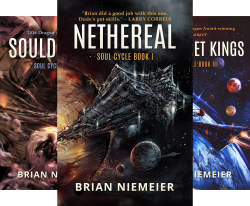 If you haven't read the first three Soul Cycle books, there's still time to catch up on my award-winning SFF series before the final book comes out. Kind of sad since it's the end of an era, I discovered you and your work through Geek Gab. That said, it's completely understandable. Especially if you are thinking about picking up Nick Cole's strategy. Something like that would require pulp speed. Best of luck to you, and Geek Gab. Thanks for listening and reading! Take heart. This reprioritization will allow me to bring you even more entertainment! Thanks for all the time you have put into the show, especially the "On the Books" episodes. Maybe we'll hear a few more of those in the future? Either way, best of luck with your future career! You're welcome. DW has left the door open for more On the Books in the future. I'd like to to another special or two, but it'll depend on time constraints. Gadzooks! Jeffro leaves Castalia and now you leave GeekGab! If I didn't realize that this just means more great reading material for me, I'd be upset, Good Sir! Heaven forfend I upset my loyal readers! Happily, that is one of the reasons I came to this decision. More quality reading material on the way! Sad to hear, but it was a good run. It is almost as if you and Jeffro timed this together. This is slightly related, but I was thinking similar when listening to this episode of Geek Gab. I enjoy the show and the reviews, but a friend also invited me to see this film and I just couldn't muster up the interest. Marvel movies are still good enough, but after all the recent happenings involving Hollywood, and my already sore wallet, I just can't justify it. There are more important things I can spend my money on. I plan on still listening to the podcast, but it will, unfortunately, be as more of an outsider to what is going on in the pop culture world. Good luck with your new direction. I hope it works out. Sounds like we're on the same page, re: current Hollywood movies. My position is, if I'm going to exhort people not to give money to people who hate them, I'd better put my money where my mouth is. As for the new direction, think of it as a return to form. How do I sad emoji? Cheer up, little camper. We'll get through this thing together, OK? Thank you for all the good gabs and friendship over the past few years. I am looking forward to what's next from you! The gabs might be drawing to a close, but the friendships will endure! I'll do my best not to let you down, brother! I hear you, I gave up video games long ago for the sake of my work. Ditto everyone above. I was a late comer to your GeekGabs, but liked them. I feel you man, I've cut way back on my television and Internet consumption to write more. Pulp factor 5! I've known a fair number of people who were good podcasters, but damn few who could have written a series as spectacular as Soul Cycle. Go where your talents are best used, and be a guest now and then. It's not completely either/or. BTW, thanks for having me on the show. You guys did a fine job of it, every time. Thanks, Jeff. Your vote of confidence means a lot! It was a blast having you on the show. Delighted I managed to squeak in as a guest on one of your last Geek Gabs. Thanks again for the opportunity. You're welcome. You did a great show!